James Young (1811-1883) was a chemist from Glasgow, Scotland. In 1847 he noticed a natural petroleum seepage in the Riddings colliery at Alfreton, Derbyshire from which he distilled a light thin oil suitable for use as lamp oil. 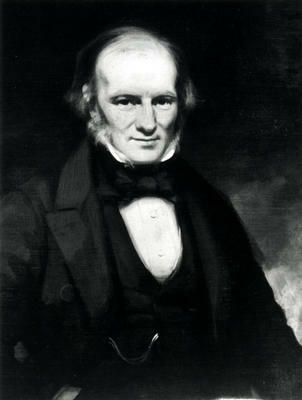 In 1848 he established an oil refinery at Alfreton. Petroleum can occur naturally but what the modern world needed was petrol artificially distilled. Young theorized that natural petroleum somehow originated from the action of heat on the coal seam and from this thought that it might be produced artificially. After many experiments Young found that by slow distillation he could obtain a number of useful liquids from it, one of which he named paraffine. He took out a patent dated 17 October 1850. Young entered into partnership under the title of E.W. Binney & Co. at Bathgate in West Lothian and E. Meldrum & Co at Glasgow. The works at Bathgate were completed in 1851 and became the first truly commercial oil-works and oil refinery in the world. In 1852 Young took out a US patent for the production of paraffin oil by distillation of coal. Many entrepreneurs sought to emulate Young's success and, for a short period, supplies of torbanite (boghead coal) were dispatched to destinations throughout the world, both to those licensing Young's patent, and to those trying to reproduce the process. Even though Young held the patent, some countries realised they had their own oil and coal reserves. In 1859, an oil well was drilled in Titusville Pennsylvania and within 2 years, American petroleum was being produced. Soon American petroleum, that they called kerosene, was being imported to Britain even though Young had successfully sued for patent infringement in the USA. It was more crudely refined and that meant it was cheaper than Young's fuel. It also had a reputation for causing explosions and house fires. The Scottish oil industry continued to fight a fierce battle against the American product. 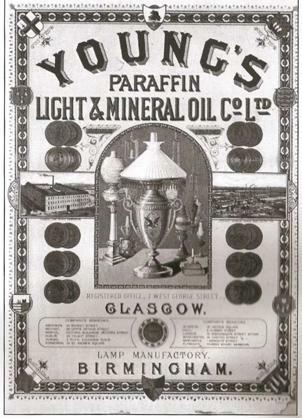 In 1865 James Young bought out his business partners and a year later formed Young's Paraffin Light & Mineral Oil Co.